The mission of The National Society of The Colonial Dames of America in The Commonwealth of Kentucky is to collect and preserve historic artifacts; to preserve and restore buildings connected with the early history of our state; to preserve and operate the museum property known as Liberty Hall Historic Site; to educate the public; to create an interest in history; and to stimulate a spirit of patriotism. 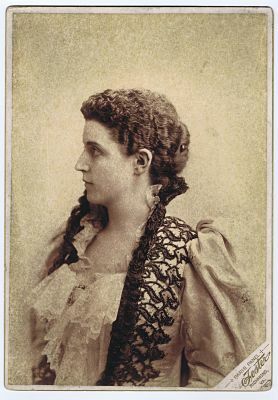 The Kentucky society's first president was Mrs. Simon Bolivar Buckner (Delia). She served from 1897-1913. Buckner was from Virginia and was a charter member of the Virginia NSCDA society. She is pictured on the left. 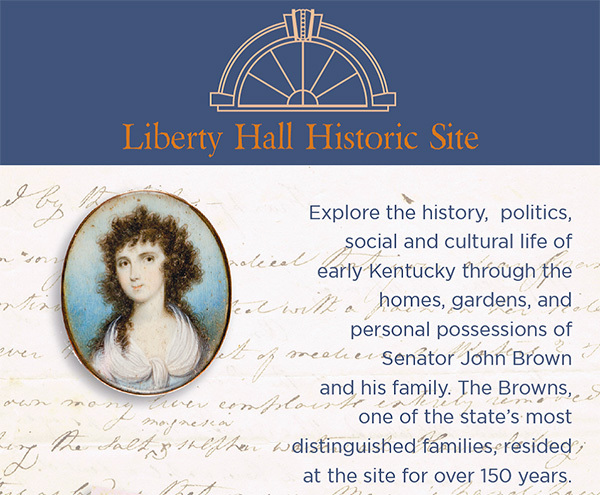 For more information about the NSCDA-KY and its support of Liberty Hall Historic Site, please visit its website at www.nscdaky.org. 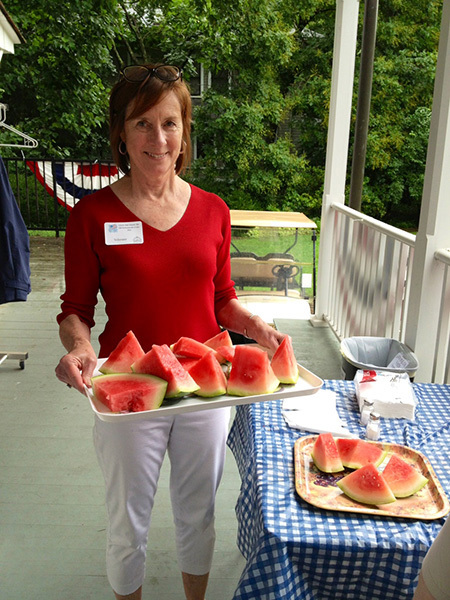 NSCDA-KY member Ellen Bland volunteers at Old-Fashioned 4th of July; Amy Spears volunteers at the Planting of the Annuals; and Edie Bingham is presented the Margaretta Mason Brown service award by Mary Bradley at the NSCDA-KY Annual Meeting. 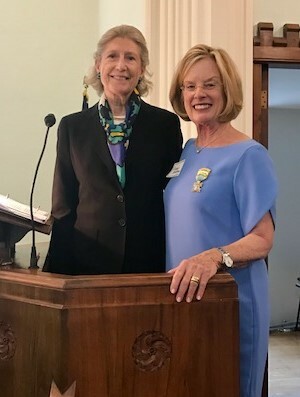 The Kentucky Society is a member of The National Society of The Colonial Dames of America. 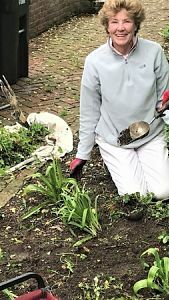 The National Society of The Colonial Dames of America promotes appreciation for the people, places and events that led to the formation and development of our country. As an unincorporated association of 44 Corporate Societies with more than 15,000 members, The NSCDA has been a leader in the field of historic preservation, restoration, and the interpretation of historic sites since its New York Society first undertook the preservation of the Van Cortlandt House in 1897. The National Society headquarters is located at Dumbarton House, a Federal period house museum in Washington, D.C.. For more information about the NSCDA, please visit its website at www.nscda.org. For more information about other museum properties owned and supported by the NSCDA and its corporate societies, please click here.